Biofilms are cell communities wherein cells are embedded in a self-produced extracellular polymeric substances (EPS). The biofilm of Clostridium acetobutylicum confers the cells superior phenotypes and has been extensively exploited to produce a variety of liquid biofuels and bulk chemicals. However, little has been known about the physiology of C. acetobutylicum in biofilm as well as the composition and biosynthesis of the EPS. Thus, this study is focused on revealing the cell physiology and EPS composition of C. acetobutylicum biofilm. Here, we revealed a novel lifestyle of C. acetobutylicum in biofilm: elimination of sporulation and vegetative growth. Extracellular polymeric substances and wire-like structures were also observed in the biofilm. Furthermore, for the first time, the biofilm polysaccharides and proteins were isolated and characterized. The biofilm contained three heteropolysaccharides. The major fraction consisted of predominantly glucose, mannose and aminoglucose. Also, a great variety of proteins including many non-classically secreted proteins moonlighting as adhesins were found considerably present in the biofilm, with GroEL, a S-layer protein and rubrerythrin being the most abundant ones. This study evidenced that vegetative C. acetobutylicum cells rather than commonly assumed spore-forming cells were essentially the solvent-forming cells. The abundant non-classically secreted moonlighting proteins might be important for the biofilm formation. This study provides the first physiological and molecular insights into C. acetobutylicum biofilm which should be valuable for understanding and development of the biofilm-based processes. Microbial cells could synthesize extracellular polymeric substances (EPS) to build biofilm communities with enhanced survival and metabolic capacities . In natural settings, biofilms are commonly formed by cells attached to surfaces or interfaces, like the surfaces of water pipes, stones in a river, and indwelling devices in hospital patients. In laboratory, biofilms are usually attached to the inside wall of incubators, grown on agar plates or static liquid surfaces , and their formation could often be facilitated by solid carriers submerged in culture media, such as cotton fibre, plastic, stainless steel, glass or clay brick [3, 4]. Some nutritional factors were shown to be important for biofilm formation by some species. For some prokaryotes like Staphylococcus aureus, Pseudomonas aeruginosa and P. fluorescens, iron limitation repressed biofilm formation while high iron rescued biofilm formation [5, 6]. In Escherichia coli, Salmonella sp. and anaerobic sludge communities, low-nutrient media (e.g., glucose-minimum medium, minimum-salts medium, media with relatively less peptone or a high C/N ratio) appeared to favor EPS production and biofilm formation [7–9]. As a multicellular form of microbial life, biofilms could exhibit emergent properties that are quite distinct from those of free-living cells and have attracted increasing attention in biotechnological processes as well as in medical processes . More and more biofilms are engineered as cell factories for biomanufacturing . One canonical example is the biofilm of solventogenic Clostridium acetobutylicum which is an important industrial platform capable of producing a range of biofuels and bulk chemicals . It was shown that butanol tolerance of C. acetobutylicum cells in biofilm was three orders of magnitude higher than that of planktonic cells under certain conditions . Operated in a continuous mode, Clostridium biofilms increased the productivity by almost 50-fold [4, 13]. Enhanced metabolism of pentose as well as hexose and enhanced solvent biosynthesis were also extensively demonstrated for C. acetobutylicum biofilm [14–16]. In general, superior phenotypes (such as the improved tolerance and metabolic activities) of EPS-encased biofilm cells could be attributed to two aspects: genetic regulation and EPS architecture. Living together in biofilms, cells tend to exhibit a different pattern of gene expression. Some genes are repressed or activated, thus cellular structure and functions are modulated [17, 18]. On the other hand, highly hydrated EPS matrix can be a protective barrier and provides cells with a favourable microenvironment. EPS plays an important role in exclusion of toxic substances [17, 19]. It keeps cells in close proximity and enables the development of high-density cell communities with intense cell–cell communication and cooperation [19, 20]. EPS matrix also provides excellent conditions for retention of extracellular proteins, functioning as an enzyme reservoir for external processes . However, so far little has been known about C. acetobutylicum biofilm. Despite the observation of C. acetobutylicum biofilm under various conditions, the underlying molecular basis and regulatory processes remain to be explored . Deciphering the EPS matrix and cell physiology in the biofilm will be important for optimization and control of biofilm-based processes. Recently we reported the first transcriptomic study of C. acetobutylicum biofilm  and revealed that heterogeneity of C. acetobutylicum EPS conferred improved resistance to harsh environments . In this study, we will further shed light on C. acetobutylicum biofilm by investigating the cell physiology and EPS composition in the biofilm. Cultures of C. acetobutylicum B3 (CGMCC 5234) were grown in modified P2 medium containing 10 g/L glucose as the sole carbohydrate source for seed culture. Fermentation experiments were performed anaerobically in 2-L stainless steel columns containing 1.5 L of P2 medium (glucose 60 g/L; K2HPO4 0.5 g/L; KH2PO4 0.5 g/L; CH3COONH4 2.2 g/L; MgSO4·7H2O 0.2 g/L; MnSO4·H2O 0.01 g/L; NaCl 0.01 g/L; FeSO4·7H2O 0.01 g/L; p-aminobenzoic acid 1 mg/L; thiamine 1 mg/L; biotin 0.01 mg/L) at 37 °C with initial inoculum 10%(v/v). Cotton towel was used to facilitate the formation of biofilm and continuous culture was performed with broth replacement every 12 h, see our previous work for details [12, 22]. Each piece of cotton towel (2 cm × 3 cm) with attached biofilm was taken from fermenters at predetermined time, immersed in 20 mL of 0.1 M NaOH (the mass of NaOH solute was calculated as W1) and vortexed to completely dissolve the biofilm. Then, the piece was removed and rinsed twice with a total of 40 mL of pure water. All the volumes were mixed together and the total volume was determined. Then, 3 mL of the mixture was dried and weighed to deduce the total dry weight (W2) of the mixture. Biofilm formation was quantified as (W2 − W1)/(2 cm × 3 cm). To collect biofilm cells for transcriptomic analysis, pieces of cotton towel were harvested from the fermenter typically at 6 h after each broth replacement and rinsed twice with PBS buffer (137 mM NaCl, 2.7 mM KCl, 8 mM Na2HPO4 and 2 mM KH2PO4, pH 7.4, 4 °C) to remove contaminating planktonic cells. Then, the cotton towel was submerged in 15-mL PBS buffer and the biofilm was scraped off the cotton towel. The resulting suspension was centrifuged at 8000×g for 6 min at 4 °C to pellet the biofilm cells. All the cells were frozen immediately using liquid nitrogen and then stored at − 80 °C prior to RNA extraction. RNA extraction and transcription analysis were performed as previously described . Resulting microarray data were uploaded to the Gene Expression Omnibus (GEO) database under Accession Number GSE72765. Hierarchical clustering was performed using R-software and clusters were visualized with Tree-view . Light microscopy was used for morphological observation. Each piece of cotton towel (approximately 2 cm × 3 cm) with attached biofilm was taken from fermenters at predetermined time points, immersed in 0.1 M NaOH at 4 °C for 10 min and vortexed to completely disperse cells within the biofilm. Then, 50 ul of suspension was transferred to a microscope slide and air-dried. Safranin O was used as a fluorescence dye that can be excited with green light . It is well known for nuclear staining and was also reported to stain mucin, cartilage, starch and plant tissues . In this study, it also differentially stained cells and endospores under light microscopy. Cells were stained with 0.5% safranin O for 30 s, washed gently with water and then air-dried for light microscopy. As the real production system with cotton towel as biofilm carrier was not suitable for detailed observation of the biofilm, fluorescence microscopy using microscope slides as biofilm carriers was used to observe the biofilm in detail. Microscope slides were immersed in 100-mL Duran bottles containing 50 mL of fermentation broth at the time of inoculation (10%, v/v). All the bottles were kept static in an anaerobic system (Whitley DG250 workstation, Don Whitley Scientific Limited, UK) at 37 °C. After predetermined time intervals, the slides were withdrawn from the bottles, rinsed twice with PBS buffer (pH 7.4), then air-dried in the anaerobic system. Samples were stained with 0.5% safranin O as described above before imaging in the green channel in a Leica DM2500 microscope. Various methods were tried to dissolve C. acetobutylicum biofilm, including EDTA treatment, hot water treatment, sonication and enzymatic digestion. Usually, these methods could physically or chemically dissolve biofilm matrixes and have been commonly investigated for EPS extraction . However, none of these methods could effectively dissolve the C. acetobutylicum biofilm except using NaOH (Additional file 1: Figure S1). The supernatant proteins and polysaccharides extracted by NaOH were much more than those from other methods, while the DNA ratio which could be an indicator of cell lysis was adequately low (Additional file 1: Table S1). Biofilm attached on cotton towel was immersed in 0.1 M NaOH at 4 °C for 30 min. This would get the biofilm matrix dissolved completely and quickly. The suspension was then centrifuged (10,000g) at 4 °C for 10 min to pellet cells. To the supernatant containing soluble EPS, 1.5 volume of ethanol was added to precipitate polysaccharides. Precipitated polysaccharides were collected through centrifugation and the supernatant was adjusted to pH 4.2 and kept overnight at 4 °C to precipitate proteins. Interference of possible cell lysis on the process was excluded because cells were all apparently intact after the short treatment with NaOH as was confirmed by microscopy. Also, control experiments solely with an equal volume of C. acetobutylicum cells going through the same procedures did not yield apparent sediments. An aliquot of 0.5 g wet polysaccharide extract was dissolved in 35 mL of 0.1 M NaOH. The polysaccharide solution was filtered through a 0.45-µm membrane filter (Fisher Scientific). Polysaccharides were isolated with the Q-Sepharose fast flow (QFF) chromatography column (AKTA, GE Healthcare, USA), eluted with a step gradient of NaCl (dissolved in 0.1 M NaOH) in 0, 0.3, 0.4, 0.6, and 0.8 M steps, at a flow rate of 1.5 mL/min. Eluent was monitored at 280 nm and carbohydrate content of each fraction (200 µL) was determined according to the phenol–sulphuric acid method . The 1-phenyl-3-methyl-5-pyrazolone (PMP) derivatization method  was used to analyze monosaccharide composition. Each polysaccharide (2 mg) was hydrolyzed with 2 M trifluoroacetic acid (TFA) at 105 °C for 3 h. TFA was evaporated by adding methanol under reduced pressure. The hydrolysis product was derivatized with PMP in 0.3 M NaOH for 1 h at 70 °C, and then neutralized with HCl. The derivatives were analyzed using a Thermo C18 column (250 mm × 4.6 mm) coupled to an Agilent HPLC–DAD at 245 nm, at a flow rate of 0.8 mL/min of mobile phase: phosphate buffer (0.1 mol/L, pH 7.0)/CH3CN = 83/17 (v/v). Monosaccharide composition and the molar ratio analysis were carried out by comparing the retention times and peak areas with those of monosaccharide standards. 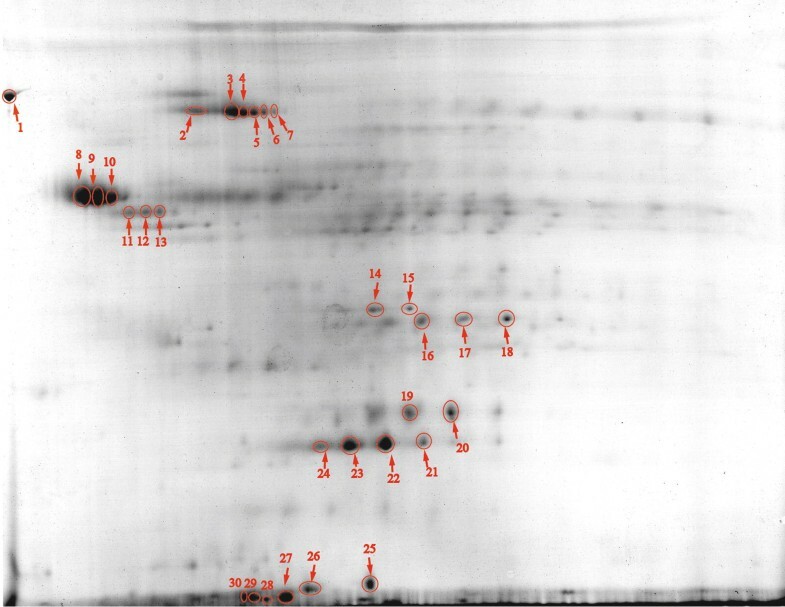 Proteins precipitated after the pH adjustment were sent to Shanghai Boyuan Biological Technology CO., LTD (Shanghai, China) for LC–MS/MS analysis. Proteins isolated by two-dimensional (2D) SDS-PAGE were analyzed using an ABI 4800 Plus MALDI TOF/TOF system (Life Technologies). Protein identification was performed using MASCOT 2.3 (http://www.matrixscience.com/, Matrix Science, UK) against the NCBI-Clostridium acetobutylicum database using a significance threshold of p < 0.05. Biofilm formation by C. acetobutylicum in fermenters during continuous cultivation was quantified. Accumulation of biofilm was most apparent during day 3 and day 4. The biofilm could be built up with a maximum dry weight of 28 mg/cm2 on the surface of cotton towel (Fig. 1). It was found that during continuous cultivation of C. acetobutylicum biofilm, the cells eventually eliminated sporulation and displayed a vegetative growth. As shown in Fig. 2, swollen clostridial-form cells first appeared at 18 h. These cells are to be the mother cells for spores. With the sporulation, fore spores were formed at 30 h. The final mature spores were released and peaked at 42 h, after which they disappeared rapidly. By 102 h, spores could hardly be observed, leaving almost exclusively vegetative cells. At the same time, the vegetative cells underwent significant morphological changes: from short single cells to long-chain cells. 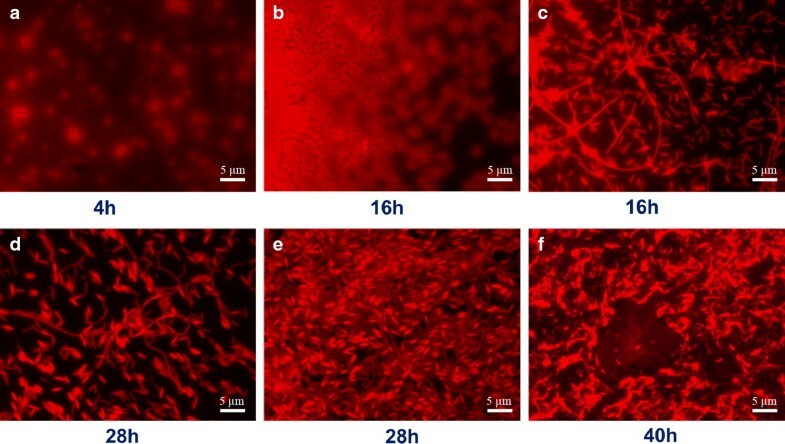 The long chains of cells were observed from 66 h, apparent at 102 h, and predominantly present in the biofilm after 150 h with a length around 100 µm. Inspired by the elimination of sporulation in the biofilm cells during long-term cultivation, expression of sporulation-related genes was investigated. In general, expression of the genes responsible for spore formation was apparently down-regulated in the biofilm over time (Fig. 3). Of the sporulation regulators in C. acetobutylicum, the gene encoding σK (sigK, CA_C1689) was downregulated over time by eightfold. 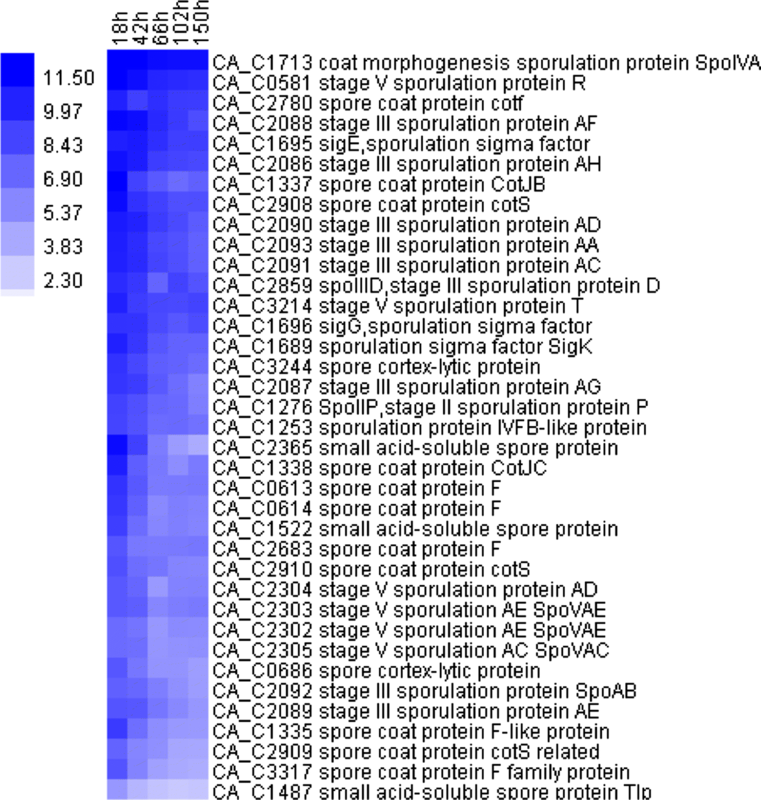 The most down-regulated genes were those involved in spore coat synthesis (CA_C0613-0614, CA_C1335, CA_C1337-1338, CA_C2808-2910, CA_C3317), which decreased over time by 6- to 24-fold. An operon CA_C2086-2093 related to stage III sporulation was down-regulated 6- to 12-fold. The small, acid-soluble proteins (SASP) that are used to coat DNA in spores (encoded by CA_C1487 and CA_C1522) were also significantly down-regulated by 48-fold (p < 0.01; Student t test), and the CA_C2365 was down-regulated by 200-fold. Overall, the decreased expression of sporulation-related genes over time was consistent with the elimination of sporulation in the biofilm. 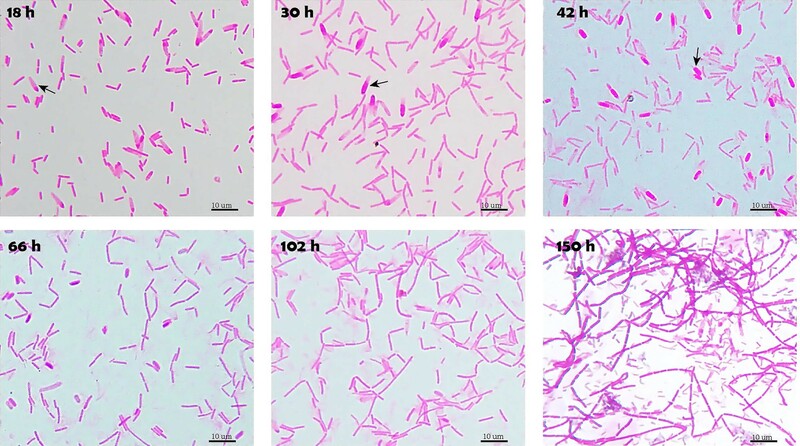 EPS and wire-like structures of C. acetobutylicum biofilm were observed. As shown in Fig. 4, at the early stage of biofilm development (4 h), cells were all buried in a gel-like extracellular matrix (as indicated by the blurred area in the image) which was typically excreted by the cells to help adhere onto surfaces. Then it developed into a three-dimensional, high-density cell colony (16 h). At the edges of the colonies, wire-like structures could be clearly observed. The wires were surprisingly long (could be more than 50 µm) and could be cross-connected. With the development, the wires were eventually imbedded in cells aggregates (28 h). At the late stage (40 h), EPS pellicles were also shown. In recent years, a kind of “nanowire” structure has been reported for some bacterial biofilms and was supposed to function in extracellular electron transport . Whether the wire structures observed here are similar to the nanowires and what their roles are in C. acetobutylicum biofilm remain to be investigated. 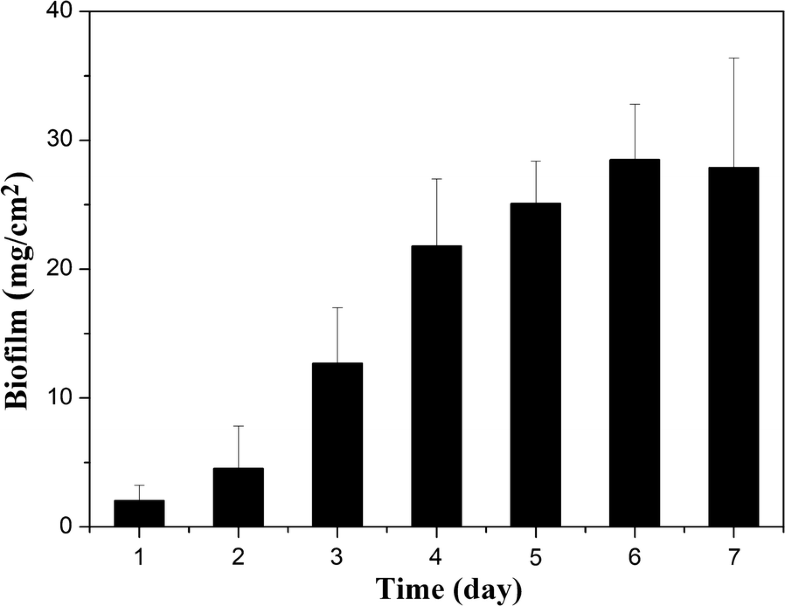 After polysaccharides and proteins in C. acetobutylicum biofilm were extracted, the polysaccharides were further isolated by anion exchange chromatography (Fig. 5). Three polysaccharides were obtained which were designated SM1, SM2, and SM3 according to their elution order. A peak at 280 nm occurred concurrently with each of the polysaccharide peaks, indicating possible presence of polysaccharide-associated proteins. The SM1 comprised the largest fraction (53%, w/w) of the polysaccharides, followed by SM2 (26%, w/w) and SM3 (21%, w/w). SM1 was also the most purified polysaccharide as indicated by a much smaller peak at 280 nm (Fig. 5). Analysis of monosaccharide composition showed that all the three polysaccharides were heteropolysaccharides with glucose as the primary component (Table 1). SM2 and SM3 were very similar in both of monosaccharide type and molar ratio, consisting of glucose (47–53%, molar ratio, the same hereinafter), mannose (13–15%), rhamnose (10–16%), galactose (9–10%), aminoglucose (7–9%), and a little ribose (4–5%). Compared to SM2 and SM3, the SM1 polysaccharide consisted of more glucose (58%), mannose (21%), and aminoglucose (13%), but much less rhamnose (0.8%), galactose (0.8%) and ribose (0.4%). SM1 also consisted of unique galacturonic acid (5.5%). The presence of uronic acid might explain why the C. acetobutylicum biofilm matrix was alkali soluble. Proteins extracted from the C. acetobutylicum biofilm were identified by LC–MS/MS. The proteins were next ranked according to their emPAI (exponentially modified protein abundance index) which reflects their relative abundance . Table 2 lists the Top 30 abundant proteins of C. acetobutylicum biofilm. Strikingly, most of the proteins are commonly known as physiological process related proteins, especially the molecular chaperones and stress proteins. The three most abundant proteins were GroEL, surface layer (S-layer) protein and rubrerythrin, which typically functions as molecular chaperone, structure protein and oxidative stress protein, respectively. Surprisingly, many of the proteins are typically known as intracellular proteins such as the enzymes normally functioning in central metabolism, glyceraldehyde-3-phosphate dehydrogenase (GAPDH), triose phosphate isomerase, pyruvate: ferredoxin oxidoreductase, electron transfer flavoprotein and alcohol dehydrogenase. Meanwhile, the biofilm proteins were isolated by 2D gel electrophoresis and major protein spots were identified by MALDI TOF/TOF mass spectrometry. The major proteins identified on 2D gel were well included in the Top 30 abundant proteins identified by LC–MS/MS, and the spots of the three most abundant proteins, GroEL, S-layer protein and rubrerythrin were indeed the most distinct protein spots on 2D gel (Fig. 6). In fact, most of the C. acetobutylicum biofilm proteins identified here have been recognized as a kind of non-classically secreted proteins that do not contain known sequence motifs for secretion or anchoring onto the cell surface [31, 32]. A great number of these proteins have been found to be “moonlight proteins” that have a canonical biochemical function inside the cell and perform a second biochemical function on the cell surface or extracellularly [33, 34]. Table 3 lists the proteins (from the Top 30 abundant proteins list) that have been reported as non-classically secreted proteins or moonlighting proteins. Obviously, many proteins with canonical function in central metabolism, chaperone activity, or protein synthesis and nucleic acid stability could moonlight as bacterial adhesins and interact with the environment. While these proteins were abundant in the biofilm, no apparent regulation of their gene transcription was observed (Additional file 2: Sheet 3). C. acetobutylicum has attracted considerable interest due to its unique capability of biosynthesizing a range of liquid fuels and bulk chemicals that are fundamentally important to human society. It has been long accepted that sporulating clostridial form of C. acetobutylicum cells is the solvent-forming phenotype, that is, solventogenesis is coupled to sporulation. However, Tracy and his co-workers observed a stronger correlation between solvent production and the vegetative cell type than the clostridial-form type based on flow cytometry assisted cell-sorting techniques. They also demonstrated that a sigF mutant blocked sporulation but still produced comparable solvent in batch fermentation [71, 72]. Despite this, the view that solventogenesis is coupled to sporulation is still prevailing in the field [73, 74]. Here, our results clearly showed that C. acetobutylicum could eliminate sporulation and display vegetative growth in biofilm over time. In this way, instead of being impaired, the solvent production was greatly improved [12, 22]. Therefore, it is plausible that sporulation and solventogenesis can be uncoupled in C. acetobutylicum. This is of particular importance, because it would encourage researchers to develop long-term continuous cultivation processes. Besides elimination of sporulation, C. acetobutylicum biofilm cells also exhibited significant morphological changes. The prolonged chain-like morphology observed for C. acetobutylicum biofilm cells was also observed for Bacillus subtilis biofilm cells. In B. subtilis, a transcriptional regulator SinR represses the genes responsible for EPS production and promotes cell separation and motility. During biofilm development, SinR activity is antagonized. Low SinR activity results in EPS production and loss of cell motility. Thus, motile single cells switch to long chains of nonmotile cells . Considering the presence of SinR in C. acetobutylicum, this is probably also the case in C. acetobutylicum. Despite the fact that C. acetobutylicum biofilm has been extensively exploited for producing industrial products [4, 12, 16, 21], the biosynthetic process and molecular composition of C. acetobutylicum biofilm remain completely unknown. Here, for the first time isolated polysaccharides and proteins from C. acetobutylicum biofilm were reported. C. acetobutylicum biofilm contained three polysaccharides which were all heteropolysaccharides. Recently, a polysaccharide separated from C. acetobutylicum culture supernatant was reported . Consistent with our results, the supernatant polysaccharide was also a heteropolysaccharide and its monosaccharide composition seemed similar to those of the SM2 and SM3. While the supernatant polysaccharide was characterized with glucose (34%, molar ratio), rhamnose (40%), mannose (13%) and galactose (10%) as its primary monosaccharides, the SM2 and SM3 characterized here also consisted of glucose (47–53%), rhamnose (10–16%), mannose (13–21%) and galactose (9–10%) as their primary monosaccharides (Table 1), although the monosaccharide ratio differed. However, the polysaccharide SM1 that represented the major polysaccharide in C. acetobutylicum biofilm had a more distinct composition: it contained predominantly glucose (58%), mannose (21%), and aminoglucose (13%). Altogether, it seemed that C. acetobutylicum liked to produce a variety of heteropolysaccharides varying in monosaccharide composition. In addition, the biofilm polysaccharides, especially the SM1, proved hard to re-dissolve after lyophilization. Also, they were possibly associated with some non-carbohydrate substances. Despite our try of various protein removal methods, they still defied 1H-NMR analysis. Strikingly, a great variety of proteins were found abundantly present in C. acetobutylicum biofilm. One of the most abundant proteins was a protein annotated as putative S-layer protein (Table 2; Fig. 6). The gene encoding this protein is designated CEA_G3563 in C. acetobutylicum EA2018 and SMB_G3598 in C. acetobutylicum DSM 1731. In both strains, it is located in an operon together with and downstream of an S-layer protein encoding gene . It shows 81% sequence identity to a S-layer protein from C. felsineum DSM 794 (Sequence ID: WP_077894211), but both have been poorly studied. S-layers are crystalline monomolecular assemblies of protein or glycoprotein, which represent one of the most common cell envelope structures in bacteria . In Clostridium difficile, S-layer proteins were demonstrated essential for biofilm formation perhaps due to the fact that S-layer is essential for anchoring cell wall associated proteins that are required for adhesion during biofilm formation . Studies also showed that S-layer was required for normal growth in C. difficile [80, 81], while a non-matured S-layer protein induced the apparition of a bigger biofilm . Except the putative S-layer protein, most of the C. acetobutylicum proteins were typically intracellular proteins (Tables 2, 3). It has previously been reported that a variety of Gram-positive bacteria, such as S. aureus and B. subtilis, release intracellular proteins into the external environment during stationary phase [83, 84]. These proteins are considered to be secreted in a non-classical pathway and some of them (e.g., the GroEL) have been extensively found to moonlight as adhesins and contribute to the biofilm formation [32, 33, 84]. For instance, it was shown that deletion of GroEL-phosphorylating PrkC in Bacillus anthracis abrogated biofilm formation, while overexpression of GroEL led to increased biofilm formation [85, 86]. Another intracellular protein abundant in the biofilm is a rubrerythrin encoded by rbr3B (CA_C3597). In this rubrerythrin, the order of the two functional domains is reversed compared to normal rubrerythrins . Although this rubrerythrin has been demonstrated to be involved in H2O2 and O2 detoxification, its role in biofilm remains to be studied. Besides the non-classical secretion, the abundance of intracellular proteins could also be a result of cell lysis inside the biofilm during long-term development. While a biofilm could persistently exist, a subpopulation of the cells inside is likely lysed due to various mechanisms . The biofilm matrix could act as a recycling center by keeping the components of lysed cells available [19, 88]. A biofilm-forming mechanism was recently proposed using Staphylococcus aureus or Pseudomonas aeruginosa biofilm as a model [83, 89]. In these models, cytoplasmic proteins that were released from cells or cell lysate proteins could associate with the cell surface in response to decreasing pH during biofilm formation. Considering the presence of abundant cytoplasmic proteins in the C. acetobutylicum biofilm as well as a low pH level (usually around pH 4.2) during C. acetobutylicum fermentation, this mechanism also be plausible for C. acetobutylicum biofilm. Clostridium acetobutylicum biofilm cells eliminated sporulation and performed vegetative growth over time, indicating that vegetative C. acetobutylicum cells rather than the spore-forming cells were the solvent-forming cells. EPS and wire-like structures were observed. The biofilm contained three heteropolysaccharides. The major fraction consisted of predominantly glucose, mannose and aminoglucose. A variety of proteins including non-classically secreted proteins were present in the biofilm, with GroEL, a S-layer protein and rubrerythrin being the most abundant. Of these proteins, many proteins such as GroEL, Ef-Tu and glyceraldehyde-3-phosphate dehydrogenase could moonlight as adhesins which might contribute to the biofilm formation. This study provides important insights into C. acetobutylicum biofilm. Future studies should genetically manipulate the main components to elucidate their specific roles in C. acetobutylicum biofilm. DL and HY designed experiments. DL and ZY performed experiments. WZ, YC, HN, and JW contributed materials and sample analysis. DL and ZY analyzed data. DL and HY wrote the manuscript. All authors read and approved the final manuscript. We thank Dr. Xia Zhao from Qingdao Haiyang University (Shandong, China) for the help with analysis of polysaccharides. The raw transcriptomic data were uploaded to the Gene Expression Omnibus (GEO) database under Accession Number GSE72765. All other datasets supporting the conclusions of this article are included within the article. This work was supported by the Jiangsu Provincial Natural Science Foundation of China (Grant No. : BK20150938); the National Nature Science Foundation of China (Grant No. : 21706123); the Major Research Plan of the National Natural Science Foundation of China (21390204); the key program of the National Natural Science Foundation of China (21636003); the Program for Changjiang Scholars and Innovative Research Team in University (IRT_14R28); the Priority Academic Program Development of Jiangsu Higher Education Institutions (PAPD), and the Jiangsu Synergetic Innovation Center for Advanced Bio-Manufacture. 13068_2018_1316_MOESM1_ESM.docx Additional file 1. 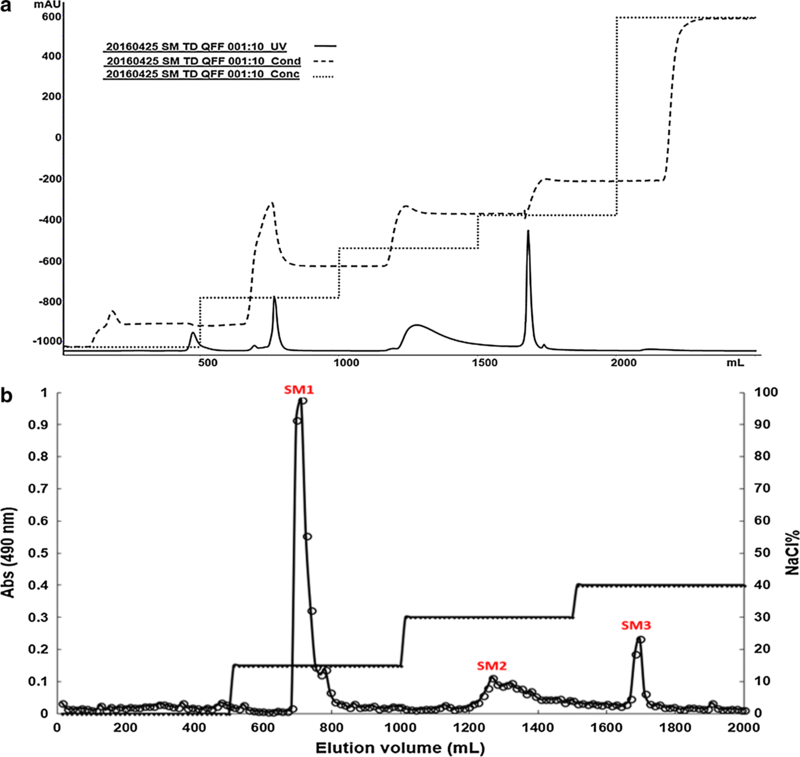 Evaluation of different extraction methods and 1H-NMR spectra of polysaccharides. 13068_2018_1316_MOESM2_ESM.xlsx Additional file 2. Full list of the biofilm proteins and relevant gene expression data.